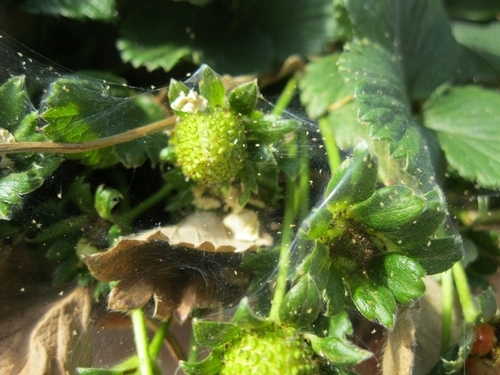 Multiple species of spider mites infest strawberries in California. 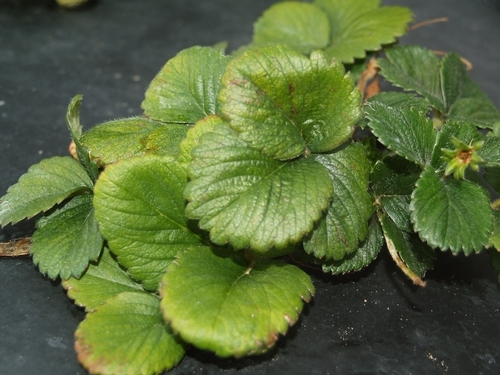 Twospotted spider mite (Tetranychus urticae) is a predominant and commonly occurring species in all strawberry growing regions on the Central Coast. Strawberry spider mite (Tetranychus turkestani) can also be found along with twospotted spider mite populations especially in the Santa Maria area during warmer parts of the production season. 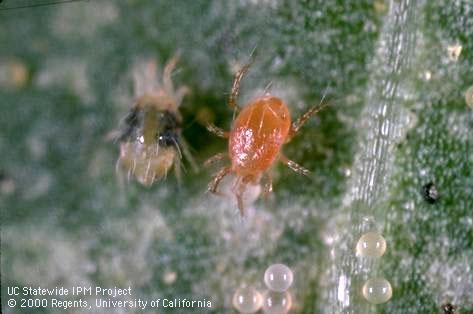 Another species of spider mite, Lewis mite (Eotetranychus lewisii) appears to occur in the Oxnard area in fields near caneberries. Lewis mites have been known to occur in the Santa Maria area at very low numbers. Carmine spider mite (Tetranychus cinnabarinus) may also be present at low numbers in some areas. Damage: Spider mites are usually present on the under surface of the leaf and form webbing at high densities. They scrape the leaf surface and feed on the plant juices. Damage appears as yellow mottling on the upper leaf surface initially. As the feeding continues, damage leads to scarring and eventual drying of the tissue. Uncontrolled populations can cause stunted plant growth, yield reduction, or even death of the plant. In the Santa Maria area, spider mites are reported to occur as early as in December soon after planting in some years. Aggressive management practices including the timely release of predatory mites can keep spider mite populations under control. Warm, dry, and dusty conditions can favor spider mite population buildup. 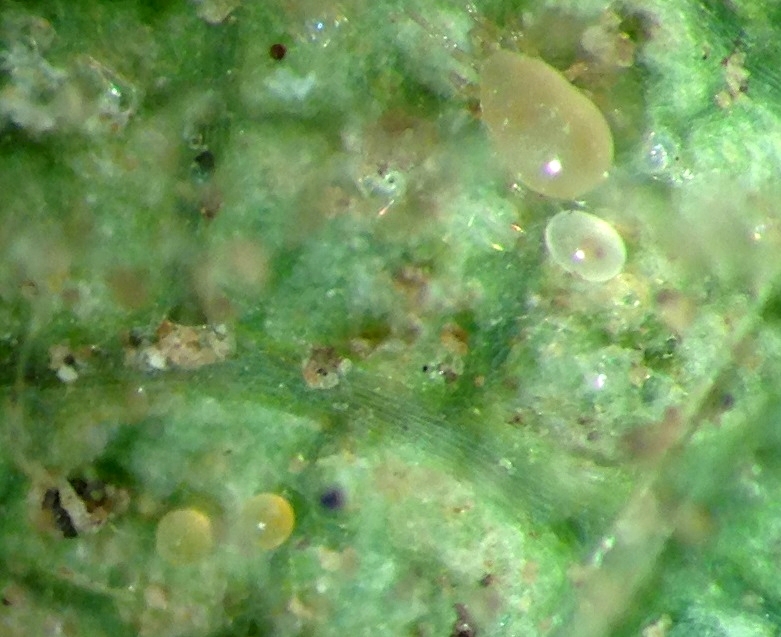 Biology: For twospotted spider mites, eggs are round and almost translucent when deposited. Larvae emerge from eggs and have three pairs of legs. Larvae pass through protonymph and deutonymph stages before becoming adults. Except for the larvae, remaining mobile stages have four pairs of legs. Two dark spots on the either side of their body give these mites their name. Adult males are small and wedge-shaped. Adult females are oval and larger than males. Twospotted spider mites complete their life cycle (from egg to adult stage) in about seven days at 86oF. Read more about spider mites and their damage in my previous articles at http://ucanr.edu/blogs/blogcore/postdetail.cfm?postnum=5771 and http://ucanr.edu/blogs/blogcore/postdetail.cfm?postnum=11600. Monitoring: Regularly monitor fall-planted strawberry crop during the first four months for spider mite infestations. Collect 10 mid-tier leaflets/acre from a small field (5 leaflets/acre if the field is large) and count the number of mites using a hand lens or using the mite brushing machine. Economic threshold is 5 mites/mid-tier leaflet. For summer-planted strawberry crop, the threshold is 10 mites/mid-tier leaflet during the first few months. After harvesting commences, thresholds are higher and range between 15-20 mites/mid-tier leaflet. Thorough and regular monitoring is important to make treatment decisions. Promote vigorous plant growth through adequate chilling, water and nutrition management. Avoid excessive nitrogen as it may increase mite infestations. Use low fences, drive slowly and water roadways to prevent dusty conditions. Avoid practices that disrupt natural enemy populations and use miticides that are safe to natural enemies. Alternate chemicals with different modes of action to reduce the risk of resistance development where strawberries are continuously grown. If you suspect mite resistance to a particular chemical, do a simple test before spraying. Prepare a small quantity of the chemical to be sprayed at a concentration equal to the field application rate. Dip a mite-infested leaf in the liquid, let it dry and then keep it in a container or a bag. For comparison, dip another mite-infested leaf in plain water and keep it separately. Observe the leaves one and two days after the treatment. 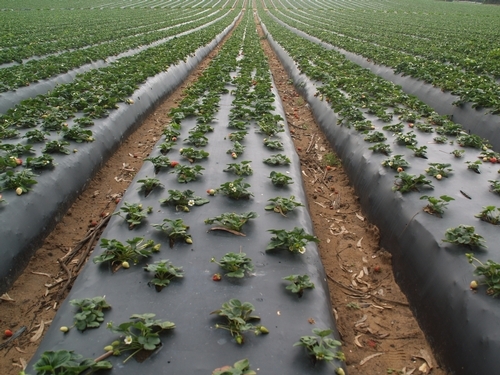 Depending on how many mites are dead on treated leaf compared to the control (water treatment), the effectiveness of the chemical can be determined. Conserve or release natural enemies like predatory mites. Phytoseiulus persimilis is a specialist predator and is effective early in the season. Neoseiulus californicus, which tolerates warmer temperatures and a wide range of humidities, is a generalist predator and a predominant species later in the season. Studies indicate that P. persimilis is not an option for controlling Lewis mite. There are several other natural enemies like minute pirate bug (Orius tristicolor), a small, black lady beetle (Stethorus spp. ), a small, black rove beetle (Oligota oviformis), big-eyed bugs (Geocoris spp. ), brown lacewings (Hemerobius spp. ), green lacewings (Chrysopa spp. ), six-spotted thrips (Scolothrips sexmaculatus), damsel bugs (Nabis spp. ), a cecidomyiid fly maggot (Feltiella acarivora), and a predaceous midge.